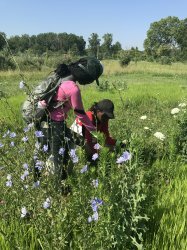 For the past two years, North Lawndale College Prep students have been working with the National Forest Foundation to help restore Midewin National Tallgrass Prairie preserve in Will County through Exelon’s Midewin Youth Corps (MYC) program. 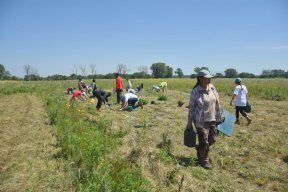 MYC students spend six weeks of their summer at Midewin, participating in ongoing restoration projects. Exelon’s partnership has allowed Midewin to employ two crews of interns as part of their summer program, where they are working to convert the former site of the Joliet Ammunitions Plant into a native Illinois landscape. Exelon funds the program and pays the interns for 30 hours of work per week, while the National Forest Foundation provides student workers with hats, gloves, shirts, and backpacks. 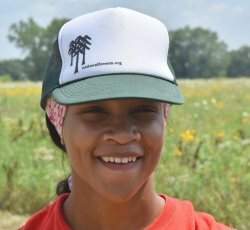 Since many students have not had the opportunity to leave Chicago’s city limits, this partnership aims to combat the “nature deficit disorder.” City youth are introduced to nature and exposed to an environmental field of studies they would not experience from traditional classroom learning. They learn how to document and track bug populations, measure nature growth, maintain trails, and remove invasive species, as well as other nature preservation skills.